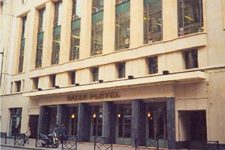 On 1 January 1830 Ignaz Joseph Pleyel and his son Camille founded the "Salle Pleyel" in Paris (originally called "Salon Pleyel"). Performers for the opening concert included, among others, the pianist Kalkbrenner, the flutist Tolou and the oboist Vogt. A special attraction of the programme was a composition by Kalkbrenner for six (!) pianos. There was an increase of this sort of thing: in the course of the opening of the second Salle Pleyel in December 1839 the big attraction of the concert was a piece for eight (!) pianos. - Since October 1927, in the present-day location at no. 252, rue du Faubourg Saint Honoré. Thus for over a century and a half the composer Ignaz J. Pleyel is the name-giver of the best-known concert hall of Paris, where many of the best-known interpreters of the piano-playing elite have performed. For the Parisians, the "Salle Pleyel" holds the same significance as does the "Goldener Musikvereinssaal" for the Viennese. On 14 November 2001, on the occasion of the 170th anniversary of the death of our Master, we organised a concert here together with the Lower Austrian Provincial Fund and the Provincial Government of Lower Austria, performed by artists of the NTO (Lower Austrian Orchestra). On 13 September 2006, an opening concert took place following intensive restoration efforts.